Gait assessment is used to plan, and treat individuals with conditions affecting their ability to walk. The gait cycle can start when one foot contacts the ground. If it starts with the right foot contacting the ground, then the cycle ends when the right foot makes contact again. Normal Step Length: around 15 inches – the distance from the heel of the front foot & the toe of the back foot. There are two phases of the gait cycle. Stance phase is the part of the cycle when the foot is in contact with the ground. It comprises 62% of the cycle, beginning with initial foot strike and ending with toe-off. Swing phase occurs when the foot is in the air and comprises 38% of the cycle, beginning with toe-off and ending with second (ipsilateral) foot strike. – Most problems with the gait occurs in the stance phase. This is the weight bearing component of the Gait Cycle. 1. Heel Strike – when the anterior compartment of the lower leg (quads) is contracting. 2. Foot Flat – foot moves into plantar flexion via the eccentric contraction of the anterior compartments of the lower leg. Knee and Hips are normally slightly flexed during in this component of the gait cycle. 4. Push Off/ Toe Off – Gastrocnemius and Soleus contracting, occurs at the ball of the foot ( 1st metatarsophalangeal – MTP joint), knee is slightly flexed and hip is extended. 1. Acceleration – foot is normally dorsiflexed to clear the ground. Knees moving into flexion. 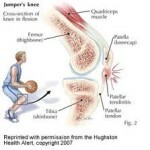 Hip moves from hyperextension to mild flexion. 2. MidSwing – foot is also normally dorsiflexed to clear the ground. weak dorsiflexors – patient trips all the time; scratch at the toe of patient’s shoes, toe scrapes the ground – to compensate = uses steppage gait. 3. Decceleration – foot is normally dorsiflexed, knee is normally in flexion moving into extension; hamstrings eccentrically contacting to slow down the swing prior to heel strike.